If you've never had beef barley soup, you're missing out. It's one of the best soups out there because it's full of so many flavors. I've bought it in a can at the grocery store before, but nothing compares to a homemade version. The canned soups are lacking in flavor and substance and if you're lucky, you'll get a few pieces of meat along with a tiny portion of vegetables. The vegetables in soup are my favorite part so making my own soup has pretty much become a staple around here if I want to be able to actually taste them. I made this soup with lots of vegetables in mind - not just for me, but for my son as well. I've found that the best way to get my son to eat a good serving of veggies is in soup form. He loves them which means that soup is my favorite thing to serve him. Hey, when you find something that works, you have to go with it! 1. Chop stew meat into small pieces and cook in large stock pot until cooked through. 2. Remove liquid from the meat as necessary to achieve a slight browned sear. 3. When meat is cooked, remove from pan. 4. 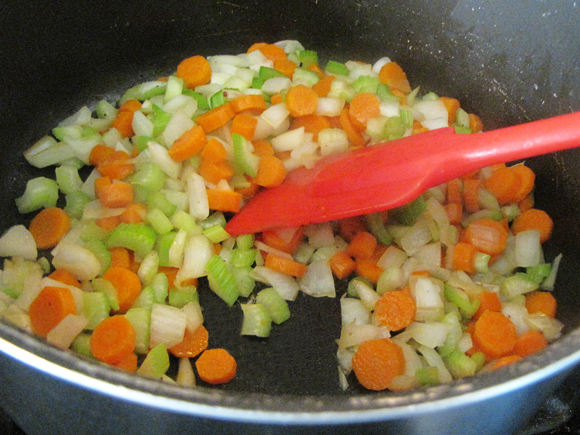 Add carrot, onion, and celery, and 1 TB butter to the same pan. Cook until soft. 5. 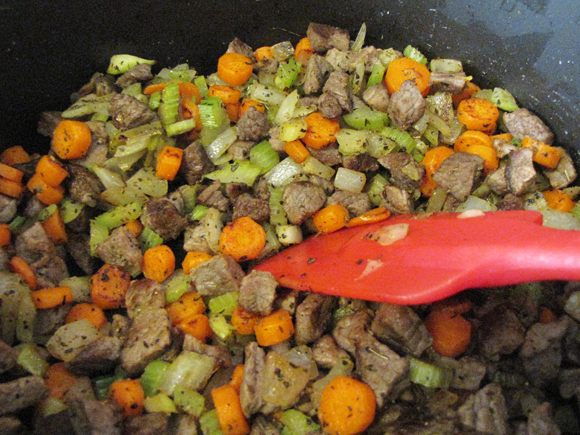 Add meat back to with vegetables and stir. 6. Slowly add broth and tomatoes. 7. Add sugar and other spices and bring to simmer. 8. Mix 2 TB butter with 2 TB flour in a small bowl until a paste forms. 9. Add by spoonfuls to soup and stir until dissolved. 11. Boil for about 10 minutes. 12. Reduce heat and simmer for 1 hour. 13. Stir in barley and bring back to boil. 14. Add peas, reduce heat, cover and simmer for 20 minutes.